This year I've gone from being a devoted gloss girl to a lipstick lady. Lipstick delivers a bold surge of colour, typically lasts longer than gloss (which can rub off within 1-2 hours of application), and usually looks more polished. Plus its packaging is more sophisticated, making the experience of applying it more fun: the click of a cap being removed, twisting the tube of colour up, smoothing it on your lips with a precise hand and blotting a kiss onto a tissue. No wonder Chanel Makeup's global creative director, Peter Philips, cited re-introducing this feminine ritual to a generation of lip gloss girls as one of the reasons for Chanel's new Rouge Coco lipstick line. Looking to expand my lipstick collection with a new shade, I picked up Stila Long Wear Lip Colour ($25 Cdn at BeautyMark) in 'Intriguing', a matte magenta hue. 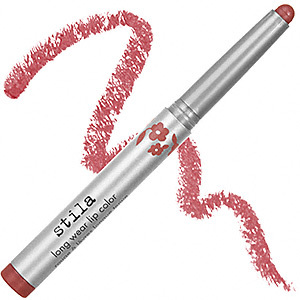 Unlike your typical lipstick, Stila's product is more like a twist-up lip crayon that never needs sharpening. This product boasts patent-pending polymers and promises to feel as moisturizing as a gloss while delivering the colour and long wear of a matte lipstick. But does it deliver? The colour is bright and vivid and really does last a long time. One application endured for 6-8 hours without fading. I also noticed that there was very little colour transfer when I drank out of glasses. The crayon-like design let me apply the lip colour precisely without a lip brush. The size of the tube makes it easy to tote in small handbags for evening. The long skinny shape of the lip colour means it breaks more easily than regular lipsticks. The fuchsia lip colour broke somewhere in the middle of the tube and has trouble retracting fully now. I didn't think it was as moisturizing as it claimed to be. Matte lipstick formulas tend to be a bit drying, and this one definitely was compared to the creamier Chanel lipstick formulas that I've tried. To make it feel good on my lips, I had to dab on Burt's Bees pomegranate oil lip balm before putting on the Stila lip colour. As the day wore on, I'd apply more lip balm on top of the lip colour at intervals. So is Stila Long Wear Lip Colour a worthwhile buy? Kind of. While I like how long-lasting the formula is, I don't like how easily the lipstick snapped and how drying it feels. I'll keep it, but I think I'll stick to creamier, more traditional lipsticks in the future. 6-8 hours without fading sound pretty damn good to me! I swear I repel long lasting lipstick. Must try this! And thank you again for your sweet words about my VLOG! I think I'll stay with my MAC....that will stay on 24 hours! I forgot that I had one in "flushed". I bought it during my pink lips phase. I love the sleek look of it but I agree that throughout the day, you need to apply some lip balm or else it becomes too drying on the lips.